The Gebunongba iron polymetallic deposit is a typical skarn deposit located at the westernmost end of the discovered iron polymetallic deposits in the Gangdese metallogenic belt. Major and trace elements of the monzonite granite related to mineralization show that these rocks are peraluminous (ACNK=1.15–1.21) and are rich in Si (76.63 wt.%–76.93 wt.% SiO2), K (K2O/Na2O ratio of 1.80–2.30), LREE and LILEs (Rb, Ba, Th, U, Pb), but is depleted in high field strength elements (Nb, Ta, Ti and HREE). In addition, these rocks show obviously negative Eu anomalies (δEu=0.48–0.55). 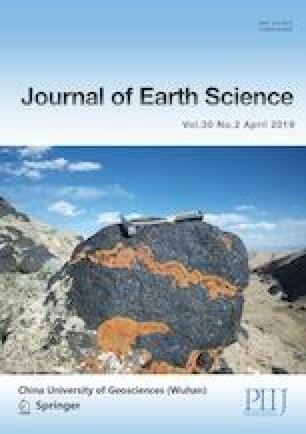 The LA-ICP-MS U-Pb age of zircons in monzonite granite is 59.72±0.55 Ma (MSWD=0.79), whereas the 40Ar/39Ar age of muscovite in iron ores is 59.22±0.61 Ma (MSWD=16.20). This indicates that the deposit formed at the syn-collision stage of Lhasa-India terrane is later than the northward subduction of the Yajiang crust. The monzonite granite has been probably derived from the partial melting of ancient lower crustal materials, which is probably resulted from the underplating of mantle-derived magmas. It is favorable for the formation of iron polymetallic deposit. Iron polymetallic mineralization is prevalent in Gangdese metallogenic belt at syn-collision stage. Therefore, syn-collision stage is an important mineralization stage for iron polymetallic deposits. The results of this study proved that iron polymetallic mineralization still took place in the western segment of Gangdese metallogenic belt and provided basis for further prospecting the deposits of the same type. This work was jointly funded by the National Key Research and Development Program (No. 2016YFC0600300), the Fundamental Scientific Research Fund for Central Universities, Changjiang Scholars Program and Innovation Team Development Plan (No. IRT1083). We thank anonymous reviewers for their constructive comments. The final publication is available at Springer via https://doi.org/10.1007/s12583-018-0984-0.